192 min [ The Master of Horror unleashes everything you were ever afraid of. ] - It is a 1990 horror/drama miniseries based on Stephen King's novel of the same name. The story revolves around an inter-dimensional predatory life-form, which has the ability to transform itself into its prey's worst fears, allowing it to exploit the phobias of its victims. It mostly takes the form of a sadistic, wisecracking clown called "Pennywise the Dancing Clown". The protagonists are "The Losers Club", a group of outcast kids who discover Pennywise and vow to destroy him by any means necessary. The series takes place over two different time periods, the first when the Losers first discover Pennywise as children, and the second when they're called back as adults to defeat Pennywise, who has resurfaced. It aired as a two-part television movie on November 18 and November 20, 1990 on ABC, and loosely follows the plot of the novel. The miniseries was filmed in New Westminster, British Columbia in mid-1990. 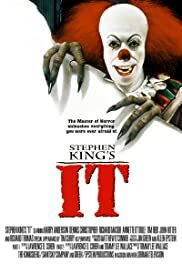 The film's cast includes Dennis Christopher, Annette O'Toole, John Ritter, Harry Anderson, Richard Thomas, Tim Reid, Richard Masur, Michael Cole, and Tim Curry as Pennywise. The miniseries has received mixed reception, praising Curry's performance as Pennywise, the performances of the child actors, but criticizing Part 2 for being too melodramatic and not as interesting or creepy as Part 1. For his work on the miniseries, Richard Bellis received an Emmy Award for his music score.